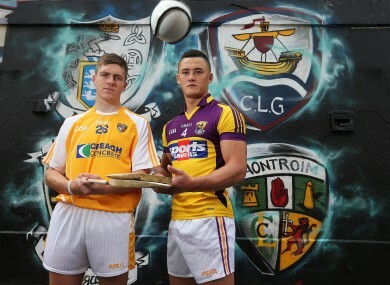 Ready for battle: Antrim captain Jackson McGreevy and Wexford captain Lee Chin. Not only will Croke Park turn green and red with the county in both the minor and senior football semi-finals on Sunday but the Mayo ladies have a semi-final of their own to look forward to in Birr on Saturday afternoon. For the Sunday Game later that night (RTÉ 2, 9.30pm), host Des Cahill will be joined by Kevin McStay and Ciaran Whelan to review all the day’s action from Headquarters. If you’re not near a TV, RTÉ Radio 1 will have full commentary on Mayo v Tyrone. Jacqui Hurley and Darren Frehill present Sunday Sport from 2pm. TG4 is the place to be if you’re looking for live coverage of the final two ladies football quarter-finals: Kerry v Mayo (12.30pm) and Cork v Dublin (2.15pm). Gráinne McElwain presents Peil na mBan Beo from St Brendan’s Park in Birr with commentary by Brian Tyers. Clear your schedule on Saturday afternoon and watch some of the country’s best young hurlers in action on TG4. GAA Beo starts at 3.50pm with Wexford v Antrim (4pm) before Galway take on Clare (6pm). Micheál Ó Domhnaill presents coverage from Semple Stadium with commentary by Brian Tyers. Presenter Marty Morrissey is joined in studio by two of the best young footballers in the country — Donegal’s Mark McHugh and Monaghan’s Conor McManus — to discuss two of the most talked-about tackles of the year. Monaghan boss John Evans is also on the panel while referee Maurice Deegan is the man in the spotlight for the Hot Seat Quiz. Kieran McSweeney is joined by former Mayo footballer John Casey and and Karl O’Kane from the Irish Daily Star to look ahead to Sunday’s clash between Mayo and Tyrone. Gemma Ní Chionnaith visits Mayo footballer Andy Moran and Tyrone’s Peter Harte, and Diarmuid Lyng speaks to former Meath footballer Colm Coyle who looks back at the famous comeback against Mayo in the 1996 All-Ireland Final.